Fruit Vinegar on the Rise… Beware! Is fruit vinegar a health drink? I was offered a glass of hot lemon drink at during recent gathering at a friend's home. "Hey this tastes really refreshing! Did you make this?" My eyes brightened as I entreated for an answer and took my second sip at the same time. In the next minute, the host placed a bottle of something in front of me. It's labelled "100% Fruit Vinegar for Drink. No Chemical Sweetener. No Chemical Preservative" and the rest of the text in front was in Korean, which was Greek to me. "This is what you are drinking. Friends recommended this healthy drink to me. It tastes fantastic, doesn't it!" "Oh, I know this Korean lemon fruit vinegar, it's super popular, many people are talking about this healthy drink" one blurted. "It's good because it's free of chemicals and preservatives. You just need to add water because it is already sweetened. You can get it at NTUC (the largest local supermarket chain)" Another added to the praises. Really? Sure it tasted great but healthy? The skeptical me wondered. The ingredients for this delicious lemon vinegar were terribly disappointing. High fructose corn syrup is one of the worst the sweeteners that catapult many health problems such as diabetes, heart diseases, obesity, arthritis and cancer. Our bodies are not designed to process this sweetener. Fructose is metabolized differently from glucose. Fructose goes straight to the liver, where it is quickly converted to stored fat, particularly belly fat, which is a dangerous type of fat due to its close proximity to our vital organs such as liver, kidneys and heart. Fructose can also lead to insulin resistance. More details on high fructose corn syrup in: Sugar is Bad, But is High Fructose Corn Syrup Worse? Furthermore, our bodies are not equipped to handle the host of artificial food colorings and flavorings. So this is a healthy drink? Far from it! And steer away from it! Today, fruit vinegars and fruit concentrates are a hit with consumers, because not only are they delicious, they are also associated with healthy, whole fruits. How they are marketed by food manufacturers make us think they are healthy. Fruit vinegars with vitamin C claim to boost body immunity, prevent cell aging, and eliminate fatigue. It is also believed that the vitamins and amino acids in fruit vinegar synthesize with the calcium inside our body to form calcium acetate and strengthen calcium absorption. However, the trouble is, many commercial fruit vinegars are not made of whole fruits but laden with artificial colors, fruity flavoring and highly processed sugars of various forms including corn syrup, maltitol, mannitol, sucralose, sorbitol which are all worse than regular table sugar. So beware of these fruit vinegars on the supermarket shelves. 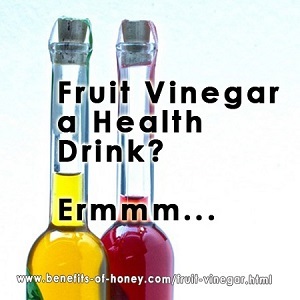 The mention of fruit and vinegar on their labels does not automatically make a product healthy. Zoom in on the ingredients listed and study what the vinegar is made up of. End of "Fruit Vinegar on the Rise… Beware!". Back to "Corn Syrup is Fine in Moderation?"